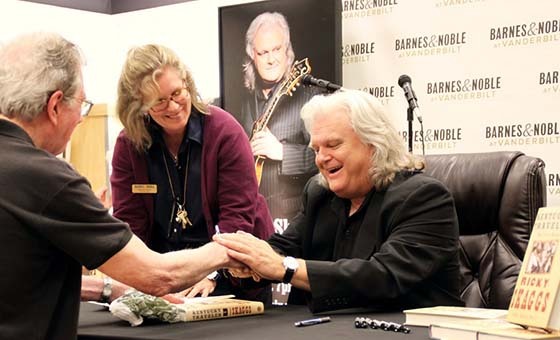 Country singer Ricky Skaggs greets a fan at the Barnes & Noble at Vanderbilt bookstore in Nashville, TN, to sign copies of his memoir, “Kentucky Traveler: My Life in Music.” Looking on is Tradebook Manager Cheryl Dalton. Ricky Skaggs has been entertaining audiences since he was a small child. As a musical prodigy, the bluegrass singer sat in with stars Earl Scruggs and Bill Monroe, playing the mandolin on country-music variety shows at the tender age of seven. He later went on to become one of the most influential country stars of the 1980s. Today, Skaggs is considered a country music legend. The 14-time Grammy Award winner recently made an appearance at the Barnes & Noble at Vanderbilt bookstore to sign copies of his new memoir, Kentucky Traveler: My Life in Music. Over 200 fans, friends and family filled the Nashville store to celebrate the publication of the singer’s autobiography. A long-time fan of country music, Tradebook Manager Cheryl Dalton was especially thrilled to meet and work with the star. “Mr. Skaggs lives on the outskirts of Nashville, so this felt like we had ‘one of our own’ in the store,” she said. 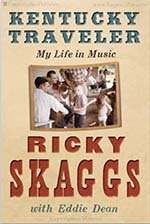 Skaggs wrote his memoir with Eddie Dean, who co-authored Ralph Stanley’s 2009 autobiography, Man of Constant Sorrow: My Life and Times. “It’s a great America story as well about faith, family and music – and how those three things really shaped my life and kind of made me who I am,” said Skaggs at the book signing.